In that busyness we often do small things without thinking. Small actions that don’t register as having a bigger impact. The statistics on food waste shows that our actions count. Our actions in and around our home and community have a bigger impact. Let me share with you some of those statistics. The average New Zealand family throws away more than three shopping trolly’s full of food. Collectively that is 123 oo tonnes of food every year at a cost of $872 million. We are all responsible for these figures. Globally this renders itself as one third of the food produced for human consumption is wasted. Scarey. Fortunately food waste is becoming a topical issue resulting in more understanding of the level of the problem and initiatives and systems being put in place to combat the problem. So what can you do to help reduce food waste? Recently on a lunch time run a ‘Divine person’ in my community had taken action to do their bit in reducing waste. 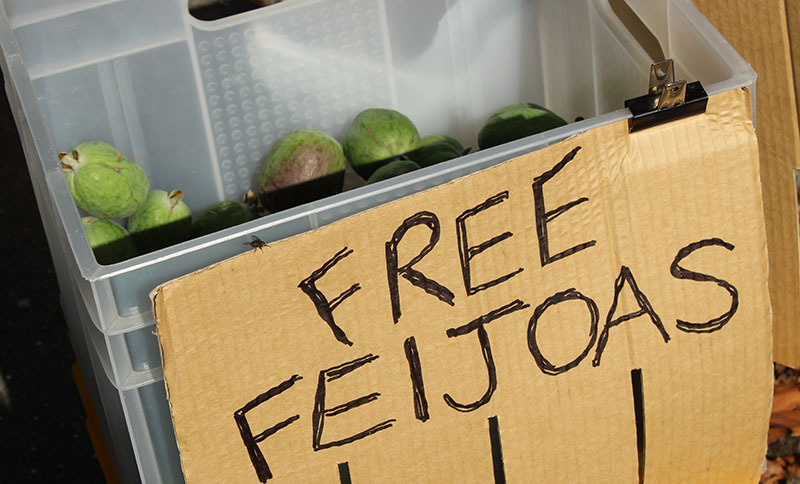 They were offering free feijoa’s outside their house. They had too many for their needs and made sure that they did not go to waste. Their actions of generosity and care go well beyond food waste. As a receiver of their generosity they created a Divine moment for my family, for our community. We enjoyed our small bag of feijoas (as others in the community did) knowing they were homegrown, thoughtfully given and very importantly…yummy. It could be as as simple as a mind shift. The management of food is something that was valued in the past and carried out with care and precision due to seasonal and supply scarcity. If you wanted to eat well year round you needed to manage and plan for supply. If it helps you to understand the level of skill and time required – give yourself the label or permission to see yourself as a manager. It is a management position and it does need thoughtful consideration, time and skill. If you plan and give it time you will work to optimise – that in your household demand for food matches supply. This will reduce food spoiling. If there is any food that does get to the point of spoiling, or you have excess quantity for immediate use then you can take steps to utilise the food, like throw it into the freezer for use at a later time, bottle it or make it into something else. Think about and understand the resources that have gone into growing and creating the food. Invest your own time in the creation of food- either growing and/or cooking your food. Start to see food for what it is – to nourish our bodies and our souls. Then the value of the food increases and wasting is just not an option. I have become very protective of the food I create knowing the thought, time and energy that has gone into its creation. Make sure you harvest your home produce. Do not let those, lemons, grapefruit, parsley, persimmons or whatever you have growing in abundance at your place go to waste. Exchange it for something someone else has in abundance, give it away to friends and family or to the wider community. You will feel great and generosity is full circle- it will come back. Next time you go to throw out some food take time to review what you could have done differently and make a small change. Enjoy create Divine moments for all – for Community.